The SOCIAL ACTION CENTER – Legazpi (SAC-Legazpi) is a church-based, non-stock, non-profit organization operating in the Diocese of Legazpi. The Most Rev. 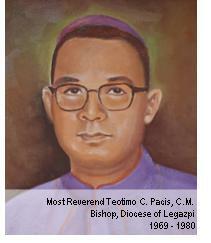 Teotimo C. Pacis established SAC in 1972 as an offshoot of the Second Vatican Council’s call for the Church greater involvement in social issues and concerns. Social Action Center then became the social action arm of the Diocese. Today SAC-Legazpi is one of the 85 Diocesan SACs coordinating with the National Secretariat for Social Action (NASSA). Its services have made it significant in the province of Albay from its socio-economic programs to its advocacy efforts on socio-political issues. In 1973 with the assistance of Catholic Relief Services (CRS), SAC-Legazpi was set up. Atty. Fidel Sarmiento was the first director of SAC-Legazp in 1973 followed by Fr. Pedro Zafe in 1974. Its programs was focused on Health and Nutrition and Targeted Maternal & Child Health Program (TMCHP). Later the TMCHP evolved to a more expanded program on economic development with programs called Targeted Women and their Families Socio-economic Development (TAWFSED) and Vendors’ Development Thru Micro-lending Project (VDMP). The two programs was then integrated and called Socio-economic Development Program (SEDP). When the Mayon Volcano erupted and Typhoons struck the province, SAC-Legazpi shifted its social action work to relief and rehabilitation programs. Simbahan Para sa Mayon was institutionalized. SAC-Legazpi initiated a strong advocacy for the farmers on land dispute in Hacienda San Miguel and Hacienda Ribaya. There it started its advocacy and efforts were placed under its advocacy for Justice & Peace Program. During the call for advocacy on environmental protection, SAC-Legazpi started its plight against mining in Rapu-Rapu and Camalig. Also, with the land reform issue in Palanog and waste management in Sto. Domingo. The Second Plenary Council of the Philippines (PCP II) played an important role for SAC-Legazpi because it guided and accelerated SAC-Legazpi’s programs on preference for the poor, people’s participation, and people’s empowerment, among others. Diocesan Synod has set its direction to be one with the poor and work towards the total human liberation and social transformation. Through its People’s Participation in Local Governance (PPLG) Program, Albay Provincial NO-PO Network for Development (ALPRODEV) was organized which priority concerns are social development advocacy, empowerment, and poverty eradication. Child Abuse Prevention & Intervention Unit (CAPIU) was institutionalized by organizing the five pillars of justice advocating for the prevention of child abuse and protection of children’s dignity. SAC-Legazpi’s current programs and services are the result of an evolution over the past 40 years. It responds to the call of times and adjusts what it needs to do in accordance with current realities—Good Governance, Disaster Risk Reduction Management, Social Safety Program, Coastal Resource Management, Peace Building & Human Rights, and Human Resource Development.